Liverel is the first and only supplement to combine Artichoke Extract with N-acetylcysteine, Choline, L-Carnitine and L-Glutathione, as well as other vitamins and trace minerals. 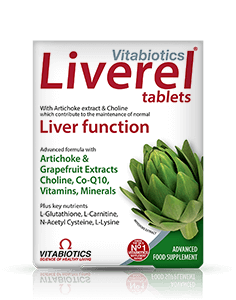 Liverel is a sensibly balanced, moderate level multivitamin, mineral and botanical formulation, with Artichoke Extract and choline to help maintain normal liver health. Body systems such as the liver, function at their best in the presence of adequate nutrition. Supplementation may be of particular benefit in those individuals who are failing to achieve the NRV intake levels every day. The liver has many vital functions including removing harmful waste products, the storage of nutrients for timely energy release, and maintaining vitality and wellbeing. Liverel is an advanced formula with Artichoke extract and choline which contribute to the maintenance of normal liver function. Artichoke extract also helps to maintain normal digestion. Provides vitamin C, zinc and selenium which contribute to the protection of cells from oxidative stress, together with vitamin D which contributes to the normal function of the immune system. The liver stores nutrients and regulates the supply of energy to the body. Liverel provides thiamin (vit.B1) and folate which contribute to normal energy-yielding metabolism. Vitabiotics recognises that Vitamin D plays an important role in many areas of health including contributing to the normal function of the immune system. Liverel provides optimum strength pharmaceutical grade vitamin D3 at a level of 20mcg (800 IU). Vitamin D3 (cholecalciferol) is the preferred form of vitamin D because it is the specific form made in the human body and therefore more effective than D2 which is found in some supplements. Liverel has been developed with the help of leading scientists and nutritionists. The Liverel formulation is based on the very latest international findings on the role of nutrients in liver health. Always read the product directions before use. Do not exceed the recommended intake. As with other food supplements seek professional advice before using if you are pregnant, breastfeeding or suffer from food allergies, and consult your doctor or pharmacist if you have an underlying medical condition, or if on medication. Vitamin supplements are not intended to treat or prevent any disease. Food supplements must not replace a balanced and varied diet, and a healthy lifestyle. Liverel provides multivitamin and mineral support to safeguard the diet. It has been formulated to be suitable for people who wish to support the health of their liver. It is not a treatment for the liver. Liverel should only be used under the guidance of your pharmacist or health care professional. To protect the amino acids and natural extracts contained in Liverel®, each tablet is individually sealed in a special protective blister.